Welcome to the first step in a journey of Self-Discovery! The Birth Chart shows all your planets, what sign they are in and what degree they are in within the sign. As a starting point, explore what sign is your Ascendant (1st House), what sign your Sun is in and what sign your Moon is in. From the Ascendant, move around the chart in a clockwise direction to the next sign and so on, for all 12 of your houses. 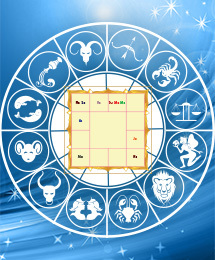 Vedic Astrology differs from Western Astrology, so if you have had your chart done in Western Astrology, it is possible that your planets may not be in the same signs as calculations are mathematically based on different coordinate views of the Zodiac. AstroVed presents the South Indian style of chart. This "map" of your chart is presented below. The sign (rasi) that contains the abbreviation AS is your Ascendant (also called Lagna) and is considered your "first house." From the Ascendant, move around the chart in a clockwise direction to the next sign which is your "second house" and so on, for all 12 of your "houses." As a starting point, explore what sign is your Ascendant, what sign your Sun is in, what sign your Moon is in. The chart below shows all your planets, what sign they are in and what degree they are in within the sign. In addition, the chart shows another level of information as it has abbreviations for the star (Nakshatra) the planet is in and what quadrant (pada) within the star. For now, we suggest you make note of what star your Moon is in.